Educators see value in getting youths outside. As society’s disconnect with nature has become more pronounced, the New Mexico Department of Game and Fish is making an effort to not only get youths outdoors, but also to get them involved. Call the class Conservation 101. It’s a class about the satisfaction of getting out and helping while reconnecting with nature. 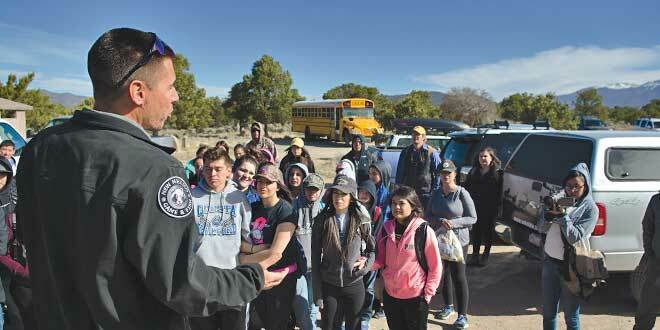 Above: Game and Fish coldwater fisheries biologist Laurence D’Alessandro provides instructions to students from Questa Junior and Senior High School and Taos High School prior to a hike down to the Rio Grande to release cutthroat trout. NMDGF photo by Zen Mocarski. The department conducts several events and programs designed to restore the younger generation’s relationship with the vast wonders of the outdoors, including getting them involved in actual conservation. 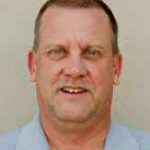 “Agencies are getting better at integrating management activities with education,” said David Gilroy, science teacher at Taos High School. In early 2016, students from two schools experienced howling winds and bitter cold as they helped department biologists in their conservation efforts. Stepping off a bus at Eagle Nest Lake on Feb. 9, 13 Moreno Valley High School students were greeted by single-digit temperatures, an auger to drill holes in the thick ice, some fishing rods and bait. 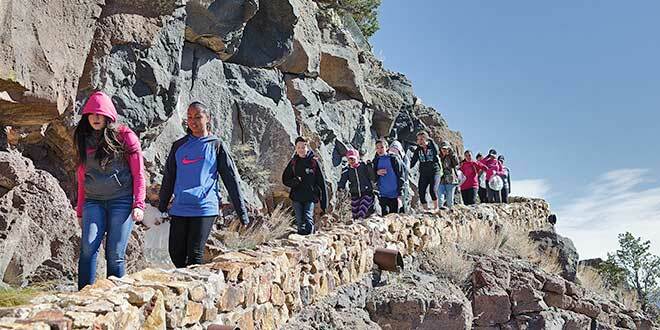 A little more than a month later, 47 students from Questa Junior and Senior High School and 15 more from Taos High School were greeted with a strenuous hike and heavy winds. All in the name of conservation and education. The Moreno students were ice fishing in an effort to catch perch for disease testing. The Questa and Taos students hiked down 800 feet with strong winds howling through the Rio Grande Gorge canyons to release approximately 3,200 Rio Grande cutthroat trout as part of an ongoing effort to restore the native fish to New Mexico waters. The students, while providing valuable help to Game and Fish biologists, got to experience an outdoor adventure. That sense of purpose and pride are not generally the rewards a student gets from sitting in front of a television or computer. It was hard work and students from the schools were in the field for hours trying to fulfill specific goals. “They loved it,” Cintas said. “It would be beneficial to have more involvement with the outdoors. I think we need more opportunities to connect students on a hands-on basis. Above: Julianna Sandoval and Anastacia Gonzalez, from Questa Junior and Senior High School take the lead down to the Rio Grande. The 47 students from Questa are members of the Junior and Senior Honor Society. NMDGF photo by Zen Mocarski. The Moreno students arrived dressed for a day of ice fishing, with winter jackets, hats and gloves. Holes were drilled in the ice and students dropped lines in hopes of catching some perch that would assist researchers in disease testing. Daboub believes the hands-on approach is critical for students. Daboub combines the field trips with pre- and post-classroom education related to the trip. Before the ice-fishing trip, he discussed wildlife diseases and how easily they can spread through a population. For Cintas, the field trip was a reward for the junior and senior Honor Society students. “I do think there is a corelation between outdoor activities and grades because the students must maintain their academics in order to participate, just like sports and extra-curricular activities,” she said. Daboub agreed that getting youths outdoors helps improve grades as well as attendance. “Absolutely their grades improve,” he said. “The level of retention improves dramatically. If Daboub appears to be passionate, there’s good reason. As students spend some time in the field, that connection is being reestablished.